Screenshot via TwitterMatthew Spencer Petersen. Matthew Spencer Petersen, one of President Donald Trump’s judicial nominees, struggled to answer basic legal questions during a Senate Judiciary Committee hearing this week. Video of a portion of his testimony went viral Thursday night. Petersen was nominated in September to be a district judge for the District of Columbia. The Trump administration has set out to drastically reshape the federal bench, but some of the nominees have received closer congressional scrutiny of late. 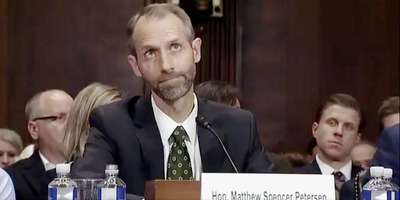 One of President Donald Trump’s nominees to serve as a US district judge struggled to answer basic legal questions during a Senate Judiciary Committee hearing in which a top Republican senator inquired about his qualifications. Petersen appeared to be the only person to raise his hand. Kennedy then peppered Petersen with additional questions that seemed to get progressively more basic. “Have you ever tried a jury trial,” Kennedy asked Petersen. “I have not,” Petersen replied. Petersen replied that he was “involved in taking depositions” as an associate attorney fresh out of law school. Kennedy began asking Petersen for basic legal definitions, to which Petersen largely could not answer. The video gained nearly 1 million views on Twitter in a matter of hours Thursday night. The Trump administration has set out to reshape the federal bench in a bid to cement a key part of Trump’s presidential legacy. The administration has nominated multiple US attorneys and judges – some of whom would receive lifetime appointments, if confirmed. Some of Trump’s judicial nominees have earned closer scrutiny of late. Sen. Chuck Grassley of Iowa, who chairs the Senate Judiciary Committee, urged Trump on Tuesday to reconsider two of his most controversial judicial picks.